The whole locker is then epoxy powder coated. This locker is supplied as standard with a cam or hasp lock there is an option of a premium wet specification Ojmar coin lock coin denomination of choice. 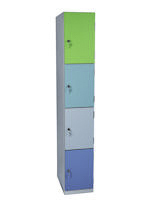 Wet area laminate door lockers are ideally suited to medium and light duty leisure use with its stainless steel door, door frame, aluminium carcase and shelf’s it is unaffected by moisture making it ideal for changing rooms with showers. With 2 carcase colours and a choice of Formica or Arpa laminate doors you should be able to select a suitable colour. If you are looking for a rust free locker for a wet changing room then this is the ideal product for you.